Ansho Mas Uchima accepts the Japanese American Living Legacy Award from Peggy Mizumoto (left) and Natalia Yamashiro-Chogyoji on Oct. 5. In 2008, Sharon Tani sought to promote an annual community service award as a tribute and legacy to her father, the late Mamoru Tani (L Company, 442nd Regimental Combat Team). She approached a few organizations and ultimately chose Japanese American Living Legacy as the host of the award. 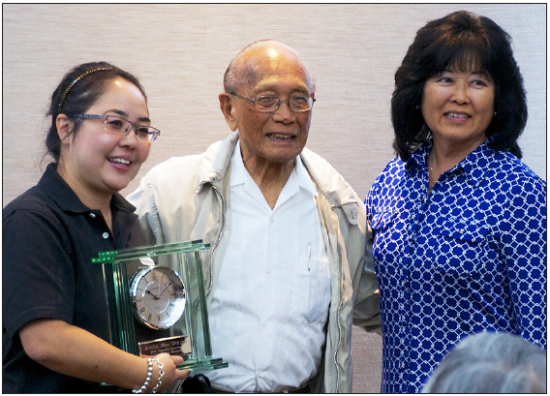 JA Living Legacy presents this award to community members who truly exhibit a tireless commitment to serving the Japanese American community by participating in work that promotes the community’s legacy. This year’s recipient is Ansho Mas Uchima. Born in Fresno, Uchima graduated from Los Angeles State College with a B.A. and from University of Southern California with an M.A. in psychology. He started studying judo in 1934 and trained under Yasutaro Matsuura and Kaname Kenneth Kuniyuki at Seinan Judo. He attained shodan before World War II. During the pre-war era, Uchima lived in the Seinan area and attended the 37th Street Elementary School, Foshay Junior High School and Manual Arts High School. In 1942, the Uchima family voluntarily evacuated to Denver. Uchima co-authored a book called “Seinan” with his good friend and Seinan neighbor Minoru Shinmoto. Uchima served in Korea with the U.S. Counter Intelligence Corps and earned a Bronze Star for meritorious service. He subsequently worked for the System Development Corporation in Santa Monica, designing computerized training materials for the Air Force and later testing computer programs. In his retirement, Uchima discovered that he had a passion for writing. His first book, “Fighting Spirit,” published by Midori Books in 2007, detailed judo in Southern California between 1930 and 1941. He discovered then how difficult it was to get a book published. Then, Uchima joined JA Living Legacy to publish two more books, “Seinan” and “Nikkei Generals and Admirals.” Uchima’s dedication and generosity formed Nikkei Writers Guild, which currently has 10 publications and three more in the editing phase. The Japanese American Living Legacy Award is granted to outstanding individuals who demonstrate a deep commitment to the community through volunteering time and resources, providing leadership, and educating the public about the community’s rich history. This award is given annually based upon nominations from the community.